UV Window Coatings has been tinting Melbourne homes and office’s since 1997, and is built on a strong foundation of highly experienced professionals embracing a wide cross section of expertise and skills, enabling our company to operate effectively within the construction, renovation and maintenance sectors. Our success is due to our strong customer service, combined with over twenty years hands on experience, plus the highest professional standards with accreditations from 3M as an authorised dealer and installer as well as the international window film association making us unique in the industry. In our drive for excellence, UV Window Coatings is dedicated to provide you with the best materials, the best workmanship and the best prices within the continuously changing market place. Call us on 1300 137 036 for a FREE quote! 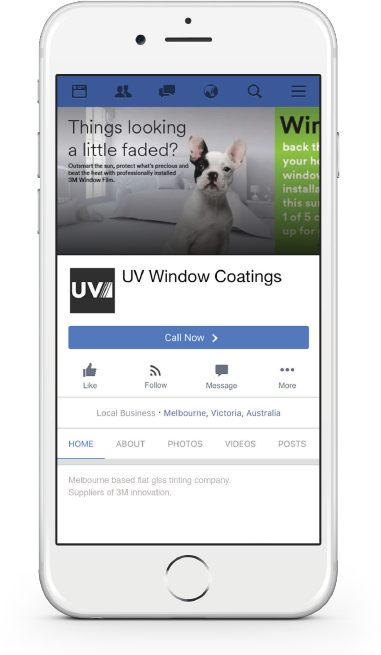 UV window coatings have been specialists in tinting Melbourne homes and office’s since 1997, they’re built on a strong foundation of highly experienced tinting professionals embracing a wide cross section of expertise and skills. This enables UV Window Coatings to operate effectively within the construction, renovation and maintenance sectors. In their drive for excellence, UV Window Coatings is dedicated to provide you with the best window coating materials, the best workmanship and the best prices within the continuously changing market place. The technologically advanced products and unmatched innovation of 3M products and support enable UV Window Coatings to achieve top results and the best practice. The licensed installation of 3M film assures that UV Window Coatings customers receive a fully backed nationwide lifetime warranty. Peace of mind from lifetime warranty, product and support from innovative 3M, and the advanced installation experience of UV Window Coatings means you’re totally covered. Our success is strongly due to the highest professional standards and top quality control implemented through our membership with the International Window Film Association as well as the accreditations from 3M as an authorised dealer and installer.